Intracranial aneurysm, also known as brain aneurysm, is a cerebrovascular disorder in which weakness in the wall of a cerebral artery or vein causes a localized dilation or ballooning of the blood vessel. Aneurysm of the basilar artery, and the vertebral arteries. Aneurysms in the posterior circulation (basilar artery, vertebral arteries and posterior communicating artery) have a higher risk of rupture. Basilar artery aneurysms represent only 3%-5% of all intracranial aneurysms but are the most common aneurysms in the posterior circulation. Cerebral aneurysms are classified both by size and shape. Small aneurysms have a diameter of less than 15 mm. Larger aneurysms include those classified as large (15 to 25 mm), giant (25 to 50 mm), and super-giant (over 50 mm). Saccular aneurysms, also known as berry aneurysms, appear as a round outpouching and are the most common form of cerebral aneurysm. Fusiform dolichoectatic aneurysms represent a widening of a segment of an artery around the entire blood vessel, rather than just arising from a side of an artery's wall. They can rupture but usually do not. Microaneurysms, also known as Charcot-Bouchard aneurysms, typically occur in small blood vessels (less than 300 micrometre diameter), most often the lenticulostriate vessels of the basal ganglia, and are associated with chronic hypertension. Charcot–Bouchard aneurysms are a common cause of intracranial hemorrhage. A small, unchanging aneurysm will produce few, if any, symptoms. Before a larger aneurysm ruptures, the individual may experience such symptoms as a sudden and unusually severe headache, nausea, vision impairment, vomiting, and loss of consciousness, or the individual may experience no symptoms at all. Almost all aneurysms rupture at their apex. This leads to hemorrhage in the subarachnoid space and sometimes in brain parenchyma. Minor leakage from aneurysm may precede rupture, causing warning headaches. About 60% of patients die immediately after rupture. Larger aneurysms have a greater tendency to rupture, though most ruptured aneurysms are less than 10 mm in diameter. The risk of a subarachnoid hemorrhage is greater with a saccular aneurysm than a fusiform aneurysm. A ruptured microaneurysm may cause an intracerebral hemorrhage, presenting as a focal neurological deficit. Rebleeding, hydrocephalus (the excessive accumulation of cerebrospinal fluid), vasospasm (spasm, or narrowing, of the blood vessels), or multiple aneurysms may also occur. The risk of rupture from a cerebral aneurysm varies according to the size of an aneurysm, with the risk rising as the aneurysm size increases. Vasospasm, referring to blood vessel constriction, can occur secondary to subarachnoid hemorrhage following a ruptured aneurysm. This is most likely to occur within 21 days and is seen radiologically within 60% of such patients. The vasospasm is thought to be secondary to the apoptosis of inflammatory cells such as macrophages and neutrophils that become trapped in the subarachnoid space. These cells initially invade the subarachnoid space from the circulation in order to phagocytose the hemorrhaged red blood cells. Following apoptosis, it is thought there is a massive degranulation of vasoconstrictors, including endothelins and free radicals, that cause the vasospasm. Intracranial aneurysms may result from diseases acquired during life, or from genetic conditions. Lifestyle diseases including hypertension, smoking, excessive alcoholism, and obesity are associated with the development of brain aneurysms. Cocaine use has also been associated with the development of intracranial aneurysms. Other acquired associations with intracranial aneurysms include head trauma and infections. Ehlers-Danlos syndrome types II and IV. Specific genes have also had reported association with the development of intracranial aneurysms, including perlecan, elastin, collagen type 1 A2, endothelial nitric oxide synthase, endothelin receptor A and cyclin dependent kinase inhibitor. Mutations in interleukin 6 may be protective.. Recently, several genetic loci have been identified as relevant to the development of intracranial aneurysms. These include 1p34-36, 2p14-15, 7q11, 11q25, and 19q13.1-13.3. Aneurysm means an outpouching of a blood vessel wall that is filled with blood. 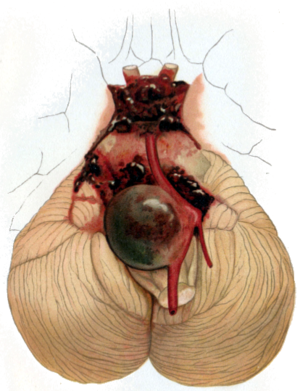 Aneurysms occur at a point of weakness in the vessel wall. This can be because of acquired disease or hereditary factors. The repeated trauma of blood flow against the vessel wall presses against the point of weakness and causes the aneurysm to enlarge. As described by the Law of Young-Laplace, the increasing area increases tension against the aneurysmal walls, leading to enlargement. Both high and low wall shear stress of flowing blood can cause aneurysm and rupture. However, the mechanism of action is still unknown. It is speculated that low shear stress causes growth and rupture of large aneurysms through inflammatory response while high shear stress causes growth and rupture of small aneurysm through mural response (response from the blood vessel wall). Other risk factors that contributes to the formation of aneurysm are: cigarette smoking, hypertension, female gender, family history of cerebral aneurysm, infection, and trauma. Damage to structural integrity of the arterial wall by shear stress causes an inflammatory response with the recruitment of T cells, macrophages, and mast cells. The inflammatory mediators are: Interleukin 1 beta, Interleukin 6, Tumor necrosis factor alpha (TNF alpha), MMP1, MMP2, MMP9, prostaglandin E2, complement system, reactive oxygen species (ROS), and angiotensin II. On the other hand, smooth muscle cells from the tunica media layer of the artery moved into the tunica intima, where the function of the smooth muscle cells changed from contractile function into pro-inflammatory function. This causes the fibrosis of the arterial wall, with reduction of number of smooth muscle cells, abnormal collagen synthesis, resulting in thinning of arterial wall and formation of aneurysm and rupture. On the other hand, no specific gene loci has been identified to be associated with cerebral aneurysm. Generally, aneurysms larger than 7 mm in diameter should be treated because they are prone for rupture. Meanwhile, aneurysms less than 7 mm arises from anterior and posterior communicating artery are more easily ruptured when compared to aneurysms arising from other locations. 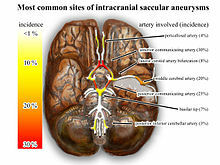 The most common sites of intracranial saccular aneurysms. Saccular aneurysms tend to have a lack of tunica media and elastic lamina around its dilated location (congenital), with wall of sac made up of thickened hyalinized intima and adventitia. In addition, some parts of the brain vasculature are inherently weak—particularly areas along the Circle of Willis, where small communicating vessels link the main cerebral vessels. These areas are particularly susceptible to saccular aneurysms. Approximately 25% of patients have multiple aneurysms, predominantly when there is familial pattern. CT angiography showing aneurysm measuring 2.6 mm in diameter at the ACOM (anterior communicating artery). Once suspected, intracranial aneurysms can be diagnosed radiologically using magnetic resonance or CT angiography. But these methods have limited sensitivity for diagnosis of small aneurysms, and often cannot be used to specifically distinguish them from infundibular dilations without performing a formal angiogram. The determination of whether an aneurysm is ruptured is critical to diagnosis. Lumbar puncture (LP) is the gold standard technique for determining aneurysm rupture (subarachnoid hemorrhage). Once an LP is performed, the CSF is evaluated for RBC count, and presence or absence of xanthochromia. 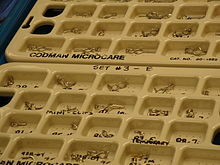 A selection of Mayfield and Drake aneurysm clips ready for implantation. Emergency treatment for individuals with a ruptured cerebral aneurysm generally includes restoring deteriorating respiration and reducing intracranial pressure. Currently there are two treatment options for securing intracranial aneurysms: surgical clipping or endovascular coiling. If possible, either surgical clipping or endovascular coiling is typically performed within the first 24 hours after bleeding to occlude the ruptured aneurysm and reduce the risk of rebleeding. While a large meta-analysis found the outcomes and risks of surgical clipping and endovascular coiling to be statistically similar, no consensus has been reached. In particular, the large randomised control trial International Subarachnoid Aneurysm Trial appears to indicate a higher rate of recurrence when intracerebral aneurysms are treated using endovascular coiling. Analysis of data from this trial has indicated a 7% lower eight-year mortality rate with coiling, a high rate of aneurysm recurrence in aneurysms treated with coiling—from 28.6-33.6% within a year, a 6.9 times greater rate of late retreatment for coiled aneurysms, and a rate of rebleeding 8 times higher than surgically-clipped aneurysms. Aneurysms can be treated by clipping the base of the aneurysm with a specially-designed clip. Whilst this is typically carried out by craniotomy, a new endoscopic endonasal approach is being trialled. Surgical clipping was introduced by Walter Dandy of the Johns Hopkins Hospital in 1937. After clipping, a catheter angiogram or CTA can be performed to confirm complete clipping. Endovascular coiling refers to the insertion of platinum coils into the aneurysm. A catheter is inserted into a blood vessel, typically the femoral artery, and passed through blood vessels into the cerebral circulation and the aneurysm. Coils are pushed into the aneurysm, or released into the blood stream ahead of the aneurysm. Upon depositing within the aneurysm, the coils expand and initiate a thrombotic reaction within the aneurysm. If successful, this prevents further bleeding from the aneurysm. In the case of broad-based aneurysms, a stent may be passed first into the parent artery to serve as a scaffold for the coils. Cerebral bypass surgery was developed in the 1960s in Switzerland by Gazi Yasargil, M.D. When a patient has an aneurysm involving a blood vessel or a tumor at the base of the skull wrapping around a blood vessel, surgeons eliminate the problem vessel by replacing it with an artery from another part of the body. Outcomes depend on the size of the aneurysm. Small aneurysms (less than 7 mm) have a low risk of rupture and increase in size slowly. The risk of rupture is less than a percent for aneurysms of this size. The prognosis for a ruptured cerebral aneurysm depends on the extent and location of the aneurysm, the person's age, general health, and neurological condition. Some individuals with a ruptured cerebral aneurysm die from the initial bleeding. Other individuals with cerebral aneurysm recover with little or no neurological deficit. The most significant factors in determining outcome are the Hunt and Hess grade, and age. Generally patients with Hunt and Hess grade I and II hemorrhage on admission to the emergency room and patients who are younger within the typical age range of vulnerability can anticipate a good outcome, without death or permanent disability. Older patients and those with poorer Hunt and Hess grades on admission have a poor prognosis. Generally, about two-thirds of patients have a poor outcome, death, or permanent disability. The prevalence of intracranial aneurysm is about 1-5% (10 million to 12 million persons in the United States) and the incidence is 1 per 10,000 persons per year in the United States (approximately 27,000), with 30- to 60-year-olds being the age group most affected. Intracranial aneurysms occur more in women, by a ratio of 3 to 2, and are rarely seen in pediatric populations. ^ a b "What You Should Know About Cerebral Aneurysms". www.hopkinsmedicine.org. ^ Bhidayasiri, Roongroj; Waters, Michael F.; Giza, Christopher C. (2005). Neurological differential diagnosis : a prioritized approach (3. Dr. ed.). Oxford: Blackwell Publishing. p. 133. ISBN 978-1-4051-2039-5. ^ Kumar; Abbas; Fausto, eds. (2005). Robbins and Cotran Pathologic Basis of Disease (7th ed.). China: Elsevier. ISBN 978-0-7216-0187-8. ^ a b c Brisman, JL; Song, JK; Newell, DW (Aug 31, 2006). "Cerebral aneurysms". The New England Journal of Medicine. 355 (9): 928–39. doi:10.1056/nejmra052760. PMID 16943405. ^ a b c d e f Goljan, Edward F. (2006). Rapid Review Pathology (2nd ed.). St. Louis: Mosby. p. 158. ISBN 978-0-323-04414-1. ^ a b c d e f g Alway, David; Cole, John Walden, eds. (2009). Stroke Essentials for Primary Care: A Practical Guide. New York: Humana Press. pp. 86–88, 153. ISBN 978-1-934115-01-5. ^ a b c DiMaio, Vincent J.; DiMaio, Dominick (2001). Forensic pathology (2nd ed.). Boca Raton, FL [etc. ]: CRC Press. p. 61. ISBN 978-0-8493-0072-1. ^ Gallia, Gary L.; Tamargo, Rafael J. (1 October 2006). "Leukocyte-endothelial cell interactions in chronic vasospasm after subarachnoid hemorrhage". Neurological Research. 28 (7): 750–758. doi:10.1179/016164106X152025. PMID 17164038. ^ a b Brown, Walter L. Kemp, Dennis K. Burns, Travis G. (2008). Pathology the big picture. New York: McGraw-Hill Medical. p. 148. ISBN 978-0-07-159379-3. ^ Caranci, F.; Briganti, F.; Cirillo, L.; Leonardi, M.; Muto, M. (2012). "Epidemiology and genetics of intracranial aneurysms". European Journal of Radiology. 82 (10): 1598–605. doi:10.1016/j.ejrad.2012.12.026. PMID 23399038. ^ VANDERVOET, M; OLSON, J; KUIVANIEMI, H; DUDEK, D; SKUNCA, M; RONKAINEN, A; NIEMELA, M; JAASKELAINEN, J; HERNESNIEMI, J; HELIN, K (1 March 2004). "Intracranial Aneurysms in Finnish Families: Confirmation of Linkage and Refinement of the Interval to Chromosome 19q13.3". The American Journal of Human Genetics. 74 (3): 564–571. doi:10.1086/382285. PMC 1182270. PMID 14872410. ^ a b c d Haberland, Catherine (2007). Clinical neuropathology : text and color atlas ([Online-Ausg.]. ed.). New York: Demos. p. 70. ISBN 978-1-888799-97-2. ^ a b Chalouhi, Nohra; Loh, Brian L; Hasan, David (25 November 2013). "Review of Cerebral Aneurysm Formation, Growth, and Rupture". American Heart Association Journal. 44 (12): 3613–3622. doi:10.1161/STROKEAHA.113.002390. PMID 24130141. ^ Howlett, David; Ayers, Brian (2004). The hands-on guide to imaging. Oxford: Blackwell. p. 204. ISBN 978-1-4051-1551-3. ^ a b White, Philip M.; Teasdale, Evelyn M.; Wardlaw, Joanna M.; Easton, Valerie (2001-06-01). "Intracranial Aneurysms: CT Angiography and MR Angiography for Detection—Prospective Blinded Comparison in a Large Patient Cohort". Radiology. 219 (3): 739–749. doi:10.1148/radiology.219.3.r01ma16739. ISSN 0033-8419. PMID 11376263. ^ Greenberg, Mark (2010-01-01). Handbook of neurosurgery. Greenberg Graphics. ISBN 978-1604063264. OCLC 892183792. ^ Mark, Dustin G.; Kene, Mamata V.; Offerman, Steven R.; Vinson, David R.; Ballard, Dustin W. (2015). "Validation of cerebrospinal fluid findings in aneurysmal subarachnoid hemorrhage". The American Journal of Emergency Medicine. 33 (9): 1249–1252. doi:10.1016/j.ajem.2015.05.012. PMID 26022754. ^ Raja, PV; Huang, J; Germanwala, AV; Gailloud, P; Murphy, KP; Tamargo, RJ (June 2008). "Microsurgical clipping and endovascular coiling of intracranial aneurysms: a critical review of the literature". Neurosurgery. 62 (6): 1187–202, discussion 1202–3. doi:10.1227/01.neu.0000333291.67362.0b. PMID 18824986. ^ Piotin, M; Spelle, L; Mounayer, C; Salles-Rezende, MT; Giansante-Abud, D; Vanzin-Santos, R; Moret, J (May 2007). "Intracranial aneurysms: treatment with bare platinum coils—aneurysm packing, complex coils, and angiographic recurrence". Radiology. 243 (2): 500–8. doi:10.1148/radiol.2431060006. PMID 17293572. ^ Raymond, J; Guilbert, F; Weill, A; Georganos, SA; Juravsky, L; Lambert, A; Lamoureux, J; Chagnon, M; Roy, D (June 2003). "Long-term angiographic recurrences after selective endovascular treatment of aneurysms with detachable coils". Stroke. 34 (6): 1398–1403. doi:10.1161/01.STR.0000073841.88563.E9. PMID 12775880. ^ Campi A, Ramzi N, Molyneux AJ, Summers PE, Kerr RS, Sneade M, Yarnold JA, Rischmiller J, Byrne JV (May 2007). "Retreatment of ruptured cerebral aneurysms in patients randomized by coiling or clipping in the International Subarachnoid Aneurysm Trial (ISAT)". Stroke. 38 (5): 1538–44. doi:10.1161/STROKEAHA.106.466987. PMID 17395870. ^ Mitchell P, Kerr R, Mendelow AD, Molyneux A (March 2008). "Could late rebleeding overturn the superiority of cranial aneurysm coil embolization over clip ligation seen in the International Subarachnoid Aneurysm Trial?". J. Neurosurg. 108 (3): 437–42. doi:10.3171/JNS/2008/108/3/0437. PMID 18312088. ^ "Germanwala Presents First Aneurysm Patient Treated Through Nose". UNC. June 25, 2009. ^ Sasidharan, Gopalakrishnan Madhavan; Sastri, Savitr B V; Pandey, Paritosh (1 January 2015). "Aneurysm clips: What every resident should know". Neurology India. 63 (1) – via www.neurologyindia.com. ^ Bharatha A, Yeung R, Durant D, Fox AJ, Aviv RI, Howard P, Thompson AL, Bartlett ES, Symons SP. 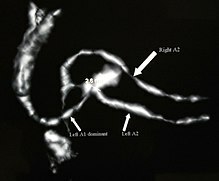 Comparison of computed tomography angiography with digital subtraction angiography in the assessment of clipped intracranial aneurysms. Journal of Computer Assisted Tomography. 2010 May–June; 34(3):440-445. ^ Brilstra EH, Rinkel GJ, van der Graaf Y, van Rooij WJ, Algra A (February 1999). "Treatment of intracranial aneurysms by embolization with coils: a systematic review". Stroke. 30 (2): 470–6. doi:10.1161/01.STR.30.2.470. PMID 9933290. ^ Spetzler, Robert; Chater, Norman (1 November 1976). "Microvascular bypass surgery". Journal of Neurosurgery. 45 (5): 508–513. doi:10.3171/jns.1976.45.5.0508. PMID 972334. ^ a b c Malhotra A, Wu X, Forman HP, Grossetta Nardini HK, Matouk CC, Gandhi D, Moore C, Sanelli P (July 2017). "Growth and Rupture Risk of Small Unruptured Intracranial Aneurysms: A Systematic Review". Ann. Intern. Med. 167 (1): 26–33. doi:10.7326/M17-0246. PMID 28586893. ^ Hop, J. W.; Rinkel, G. J.E. ; Algra, A.; van Gijn, J. (1 March 1997). "Case-Fatality Rates and Functional Outcome After Subarachnoid Hemorrhage : A Systematic Review". Stroke. 28 (3): 660–664. doi:10.1161/01.STR.28.3.660. PMID 9056628. ^ Ljunggren, B; Sonesson, B; Säveland, H; Brandt, L (May 1985). "Cognitive impairment and adjustment in patients without neurological deficits after aneurysmal SAH and early operation". Journal of Neurosurgery. 62 (5): 673–9. doi:10.3171/jns.1985.62.5.0673. PMID 3989590. 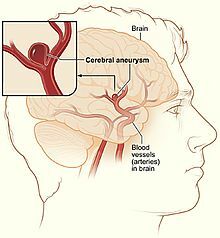 Wikimedia Commons has media related to Cerebral aneurysms.